Fort Logan (1887-1946) – Although at the time Fort Logan was established, the government was closing down many of the military posts on the frontier, the citizens of Denver were apprehensive of the increased immigration through the area and their relative isolation. Petitioning the government for a military presence, General Philip Sheridan selected a site for the fort, located about nine miles south of Denver’s Union Station. The first soldiers arrived from Forts Hays and Leavenworth, Kansas in October 1887 and began to build. Temporary barracks and a guardhouse were completed by the end of the year and the next year, plans were made for more permanent buildings. Construction began on permanent buildings in July 1888 which included officers’ quarters, a headquarters building, hospital, barracks, stable, and warehouses all surrounding a 32-acre parade ground. The post was called “the camp near the city of Denver,” but most locals referred to it as “Fort Sheridan.” the post was officially named “Fort Logan” in 1889, in honor of General John Alexander Logan, who had served in the Civil War. That same year, Colonel Henry C. Merriam came from Fort Laramie, Wyoming to become the commanding officer, and five companies of the famed 7th Infantry came with him. Troops from Fort Logan were dispatched to South Dakota in December 1890 to assist in controlling a feared “Sioux uprising.” However, assigned to the northern part of part of the state, they did not take part in the fighting which culminated with the Wounded Knee Massacre. In 1898, most of the Fort Logan troops were sent to Cuba to fight in the Spanish-American War. In 1909, the number of soldiers at the fort was dramatically reduced and in became mostly a recruiting station. Over the next two decades, with such limited staff, the large post fell into disrepair to such an extent, that many locals called it “Fort Forgotten.” This began to change in 1927, when it was re-garrisoned, and in 1940, it became a sub-post of Lowry Field in east Denver. It then became a training facility for the Army Air Corps and the inactive medical facilities began to be used once again. The post was finally deactivated in May, 1946 and turned over to the Veterans Administration. In 1959, 214 acres on the western edge were utilized to create the fort Logan National Cemetery. The Veterans Administration moved to a new location in 1951 and afterwards, many of the buildings were leased out. 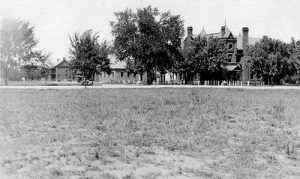 In 1960, 308 acres were deeded to the State of Colorado to establish a state hospital, which became the Fort Logan Mental Health Center. Though a number of new buildings were erected, many historic buildings continued to be used. The name was changed in 1991 to the Colorado Mental Health Institute at Fort Logan. Today, the 232 acre site includes the hospital as well as offices for several other state agencies. The site is located at 3520 West Oxford Avenue in Denver.